Daredevil #209: Keep the kids away from Matt Murdock! Well, in his defense, this “child” is actually an exploding robot. 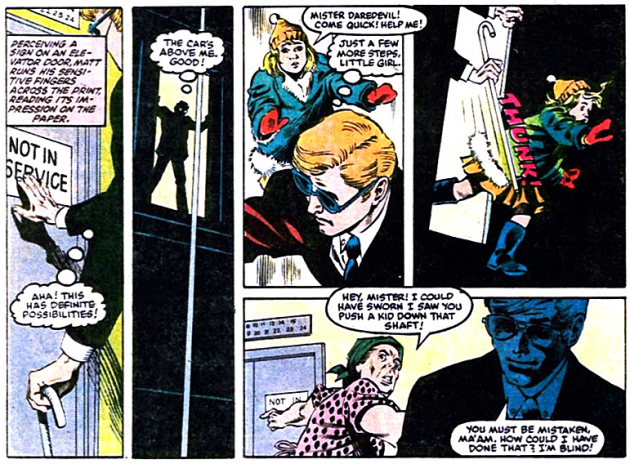 The robot, and her many duplicates, have been set to detonate when they are within range of the house of horrors that Daredevil encountered in the previous issue, when going up against the Death-Stalker’s mother. Yeah, it’s a crazy story, but a pretty funny issue. The issue in question is Daredevil #209, by Arthur Byron Cover, based on an idea by Harlan Ellison, with art by David Mazzucchelli. You know, I wonder what the lady thought she saw. It’s kind of hard to confuse pushing a child down an elevator with other things. This issue has a particularly great and very peculiar cover, in my opinion.